Americas, Tornillo and San Elizario traveled to Round Rock, Texas to compete at Old Settlers Park, the site of the UIL State Championship on Nov. 3. 1. Eastwood: The Troopers handily won the Region 1-5A Championship placing runners in the 4-6-7-8 and 15th positions for 40 points. Eastwood will make its second straight state appearance. 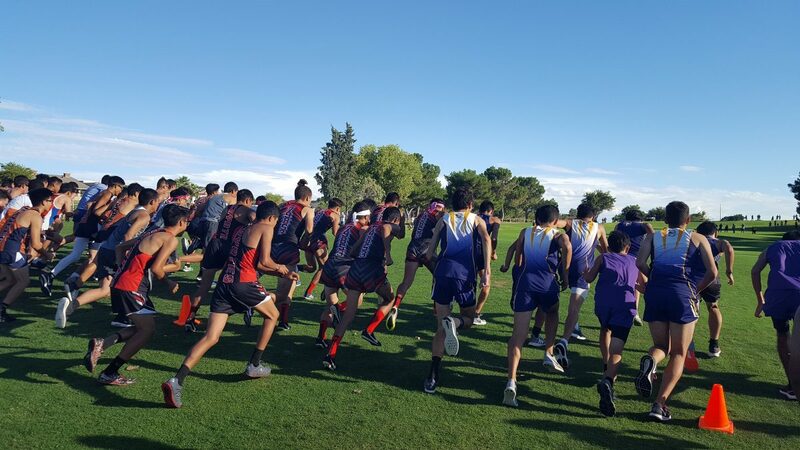 Eastwood top five were Kayn Quinones (fourth, 15:32.30), Juan Olmos (sixth, 15:35.50), Sergio Cuartas (seventh, 15:37.30), Elias Perez (eighth, 15:39.90) and Eddie Gallegos (16th, 15:56.80). The UIL State Cross Country Championship is Nov. 3 at Old Settlers Park in Round Rock. 2. Americas: The Trailblazers advanced to the UIL Class 6A State Championship for the first time in school history after finishing fourth in the Region of Doom. Tyler Rodriguez led the Trailblazers finishing 14thin 15:25.10 followed by Jacob Ye (22nd, 15:33.30), Jared Laverty (27th15:42.20), Alek Duran (44th, 15:58.50) and Gage Garcia (45th, 16:00.50). 3. San Elizario: The Eagles advanced to the Class 4A state championship finishing third with 87 points. Edwin Gomez defended his individual title in 15:17.90. Rene Arambula was 12thin 16:28.50 followed by Irvin Vasquez (22nd, 16:49.10), Martin Pargas (25th, 16:53.70) and Dilan Sanchez (27th, 16:55.80). San Elizario will race for its fifth state championship in a row. 4. Coronado: The T-Birds placed eighth at the Region 1-6A Championship. Two runners – Liam Walsh (fifth, 15:08.60) and Nick Gonzalez (seventh, 15:12.10) – finished in the top 10 and will advance to the state meet. 5. Franklin: The Cougars placed tenth at the Region 1-6A Championship. Senior Jacobo Wedemeyer was 13thin 15:26.10 and will advance to the state meet. 6. Burges: The Mustangs advance to the Class 5A State Championship for the second consecutive year after its fourth place finish at regionals. Sam Zambrano was the No. 1 for Burges finishing 11thin 15:47.00. David Gonzalez placed 25 in 16:24.30 followed by Luis Cuevas (37th, 16:43.40), Noah Yeager (40th, 16:45.40) and Angel Ortiz (47th, 16:53.70). 7. Hanks: The Knights move up one spot after its sixth place finish at the Region 1-5A Championship. Juniors Michael Abeyta and Rodger Rivera finished back to back AGAIN this time second and third in times of 15:12.70 and 15:20.40. Both will advance to the state championship. Defending state champ Graydon Morris from Aledo win the region in 14:34.40. 8. Tornillo: Tornillo moves up a spot after placing second at the Region 1-3A Championship. The Coyotes will advance to the state meet. Top runners were Ofir Ortega (second, 16:04.70), Eddie Carrillo (fourth, 16:23.50), Bryan Garcia (19th, 17:24.80) and Heribeto Amaya (34th, 17:46.60). 9. Chapin: The Huskies finished 9th in the Region 1-5A race and move up a spot. Junior Angel Contreras qualified for state after his 16th place finish in 15:57.50. 10. Eastlake: The Falcons move down three spots. Eastlake finished 10that the Region 1-5A meet but qualified two runners – Israel David (12th, 15:48.90) and Carlos Armendariz (14th, 15:55.40) – to state. The season came to end for many cross country teams. The season was filled with many highs and lows, just like the course at the Chamizal National Memorial. 7, Liam Walsh, Coronado, 15:08.60 (Mae Simmons, 10/22). 8, Nathan Hernandez, Eastwood, 15:13.4 (Woodbridge Classic, 9/15). 9, Edwin Gomez, San Elizario, 15:14.85 (NcNeil Invitational, 9/29). 17, Sam Zambrano, Burges, 15:47.00 (Mae Simmons, 10/22). 18, Ofir Ortega, Tornillo, 15:47.21 (Tornillo Invitational, 9/8). 19, Brandon Seagraves, Cathedral, 15:47:50 (Desert Twilight, 9/28). 20, Alek Duran, Americas, 15:48:30 (McNeil Invitational, 9/29). 21, Alan Alba, Coronado, 15:48.83 (Northeast Regional Park, 9/15). 22, Carlos Armendariz, Eastlake, 15:51.12 (Northeast Regional Park, 9/15). 23, Jared Laverty, Americas, 15:51.29 (McNeil Invitational, 9/29). 24, Aaron Perez, Eastwood, 15:56.30 (Tornillo Invitational, 9/8). 25, Angel Contreras, Chapin, 15:57.50 (Mae Simmons, 10/22). Many runners earned “personal bests” at last week’s Regional Cross Country Championship. 1, Edwin Gomez, San Eli, 119 (7). 2, Michael Abeyta, Hanks, 83 (3). 3, Rodger Rivera, Hanks, 77 (1). 4, Liam Walsh, Coronado, 69 (1). 8, Eduardo Carrillo, Tornillo, 46 (1). 9, Tyler Rodriguez, Americas, 44 (1). 9, Israel David, Eastlake, 44. Brandon Seagraves, Cathedral, 42 (2).